For over a week i was mulling over whether i should walk at the Hindraf rally that was scheduled for 10.00 a.m. this morning. It was a difficult decision for me because the event being race-based cuts against my grain. As a Malaysian and being passionate about Bangsa Malaysia, i just would not tolerate anything that’s remotely ethnically-driven. But this was a unique case. i was struggling with myself simply because, from where i stand, i could see that a particular large section of my Malaysian brothers and sisters have consistently been pushed to the edge and they are justified to call for the peaceful rally so their voices can be heard. It will be a show of force, no doubt, and it has been 50 long years in the making. i consoled myself that this will be the only exception i would make and, for whatever it’s worth, at least my presence at the rally would be an act of solidarity for my often-trampled and “forgotten” Malaysians. No, i did not buy into the trillion dollar class-action claim – a brilliant strategy nevertheless – but it was more a case of i cannot be totally be indifferent to this particular systematic marginalization of my fellow Malaysians anymore. All the more – this group of Malaysians. That sealed it for me irrevocably. Come hell or heaven, there’s no way i am going to renege on my promise to myself. We arranged for me to pick zorro up at his place at 7.30 a.m. sharp. You can also go here to read zorro’s report. Or, here for Haris Ibrahim’s obersevations. Or, here for Shanghai Fish’s take.
. . . . . . . continued part 2 . . . . . . .
That night i just couldn’t fall into sound sleep and was up way before the alarm clock could go off. Went through the morning ritual and had a cold shower at 6. Shortly afterwards made myself a mug of coffee and savored the brew while simultaneously smoking a cigarette. i was looking forward to the walk. i was prepared for the worse. i prayed to God for all to keep their cool and not let the situation spin out of control. i do not want anyone to get hurt nor do i wish for a day of infamy. One part of me told me that the police and FRU would have been thoroughly being briefed and be ready to strike at a moment’s command. The other part of me told me that we have here a group of citizens who had been under continuous attack for generations and were seething with discontent. They wanted to make a point and they were not afraid. That there would be agent provocateurs present to possibly exploit and ignite the situation also did not escape me. Please God, send your mighty angels to the Hindraf rally and mollify the atmosphere and keep the peace at all times. Amen. Thank You, God. i was at zorro’s place at approximately 7.10 and soon we were heading for the Kelana Jaya LRT station. As we were parking our car, some of our brothers were already alighting from theirs and walking towards the station using the overhead pedestrian bridge. zorro and i knew their destination would be the same as ours. We maintained silence and didn’t attempt to show camaraderie ness as we were no showoffs. We just wanted to be with our brothers and sisters to show solidarity. We were not going to be there to call attention to ourselves. Neither were we looking for approval nor fame. At the entrance to the station we noticed there was already a sizeable group of police personnel present and were trying to behave inconspicuously while being watchful. This i cannot speak for zorro, but i knew they had a job to do. From their demeanor and body language i could quickly discern that they appeared somewhat disinterested and were not too keen to be where they were sent. That gave me a lot of hope for the day and that my contemplation for the worse was unfounded. I was glad in my heart and felt relaxed. As we were going through our check-in points with our Touch & Go, there was already a large crowd of our brothers at the ticketing counter. What was unusual to me was that they were unusually orderly and quiet for a large bunch. There could have been 20 or 30 of them. i pretended i did not take particular notice of them. i didn’t want to make it obvious that i was conscious of their big group presence. Again, I felt glad. I was secretly pleased that it was going to be a great day. Between the both of us, few words were exchanged except for the occasional casual pleasantries. Others who were present there before us were either leisurely going through the motion of their usual Sunday morning routine, or, moodily waiting to get their hands on a cuppa to kick-start the day, or, busy with the keypad of their hand-phones. The general mood at that moment had this strange air of business-as-usual-ness about it. But I was keenly aware that in less than 2 hours a new page of history will be written. A new page of civil awakening will be etched into our Malaysian minds, hearts and souls.
. . . . . . . concluding part 3 . . . . . . . The LRT ride from Kelana Jaya was jammed pack. At every stop the same scene was noticed – a large crowd of our Malaysian brothers and sisters were waiting to board. The organizers of Hindraf were expecting a crowd of 10,000. It would be a piece of cake i thought. my hunch was for 3 times or more of the targeted figure. Our objective was to get off at KLCC but midway through the ride an announcement was made over the in-coach public address system that no stops will be made at KLCC and Ampang Park. In other words, one would have to take a long walk to the British High Commission if that’s the destination. Meanwhile zorro received a call from Haris Ibrahim (The People’s Parliament) that he should meet Haris at the Dang Wangi LRT area. i overheard zorro telling Haris that i was with him. i had no idea that Haris will be coming since he had blogged why he wouldn’t be walking this Sunday. We arrived at Dang Wangi at approximately 8.10. As we emerged from the station, zorro and i caught sight of Haris in the middle of a road-divider as he was photographing a group of rally participants approaching from the opposite side of Jalan Ampang. Haris was dressed in his full “penguin” suit normal of a lawyer. Only then it came to my realization that Haris was one of the lawyers from the Bar Council who volunteered to observe and monitor the rally that morning. As we were waiting in a group for other lawyers to turn up, Edmund Bon arrived in his “distinctive gait” as one of the lawyers had jokingly described it. We exchanged platitudes. Edmund bummed a cigarette from Haris. Harris offered and lit him up. Haris then lit his own. i did mine. zorro, of course, fired up his good old trusty pipe. As the grey cloud of smoke was disappearing from our exhalation, the conversation momentarily centered on whether we had enough nicotine shots to last the event. The unspoken tension of the morning was to be expected. In front of the Dang Wangi area where we had gathered, there were no signs or sounds of commotion. No helicopters hovering about as in the Penguin and Bersih Walks. Traffic was minimal – granted. All we could see were small groups of participants strolling by, now and then, heading for the final destination. Occasionally a police car would slowly cruise by. Nothing dramatic to suggest what i had heard earlier from zorro. 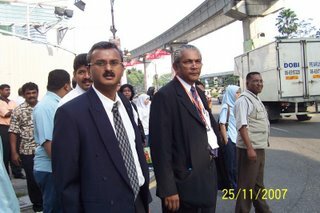 When the last two lawyers finally arrived to complete the group of 10 multi-Malaysian monitors, we were ready to walk. But before that Harris and another lawyer made a last minute dash into the Dang Wangi station to buy some bottled waters. Each of us was given a bottle each. Harris gave the signal to begin the walk and he turned to zorro and i and said to “stick” with the lawyers. We headed towards the junction of Jalan Ampang and Jalan Sultan Ismail where we were briefly interrupted by flowing traffic from Jalan Sultan Ismail. At the traffic light, i took the opportunity to snap a shot of Haris for my blog while making sure i don’t get knocked down from behind. As we crossed over to Renaissance Hotel, for the first time i saw a sea of people ahead of us. It was denser way up front near the former Le Coq Dor / Bok House area and got sparser in front of the Pakistan Embassy located next to the Renaissance Hotel. The crowd was orderly. There was no sign that any untoward incident would happen. There was no suspicious behavior or sudden moves that can trigger a panic. It wasn’t so bad after all i thought. i even ventured to think that it would be a fun day! As we came into the crowd of people at the Le Coq Dor area, my eyes were suddenly smarting. i don’t know about zorro but i didn’t think much of it. It also didn’t occur to me then that earlier tear gas and chemical-laced water had been fired in that area. i didn’t notice that the road surface was still damp. There was no strong smell of anything foreign either. i was totally immersed in the situation and lost track of other details around me. zorro and i continued to walk on, weaving through the crowd. More sting of smarts were felt in my eyes. Now my face felt the sting, too. i shouted to zorro i could not proceed any further and i’ll have to retreat. What a man, i thought. So considerate. Even at times like this? i was quite caught up with what was happening and forgot to take shots. The human side of the rally is what i was interested in. To witness and hear from the ground what and why they were there. The following are some of the verbatim remarks that stuck with me. i gave no opinion. i just listened. i could feel their frustration. i could feel their anger. my heart reached out for them. While this emotion was rushing through me and as another brother was trying to make his point, a loud cheer was heard, followed by handclaps. i presumed the crowd must have thought the lawyers were part of the group handing over the petition. Just then three loud shots rang out. i looked up and towards the direction of the noise, which was no more than 30 feet ahead of us, and i saw trails of smoke in the air. 3 rounds of tear gas were fired! zorro and i instinctively pulled away and retreated for safety. 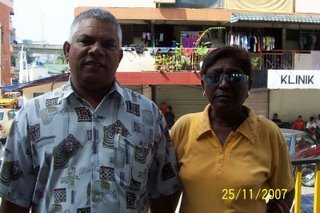 We hung around in front of Restaurant Saloma for a while and surveyed the situation. We thought of our next course of action and after a while resigned to the fact that there was no way we could have pressed on. my adrenalin must have stopped flowing for hunger pangs had begun to hit me. i told zorro that i was hungry and suggested we walk all the way to Kampung Baru for the best nasi lemak in town and think of our next action plan. We had to find a way to get to the British High Commission. Through one of the telephone conversations, Haris told us that they were now stuck at Wisma Central and the place was a deadlock. They can’t move forward any more. After our quick and late breakfast, i suggested to zorro that we catch a cab and head straight ahead to go to the British High Commission from this side of Kampung Baru (Jalan Raja Abdullah?). Instead of going straight ahead, the cab turned right into an interchange and exited at Jalan Tun Razak. There was no way we could have turned right to head towards Yow Chuan Plaza. We paid our fare and alighted. There was also a crowd milling around the area, waiting to head towards Yow Chuan Plaza. 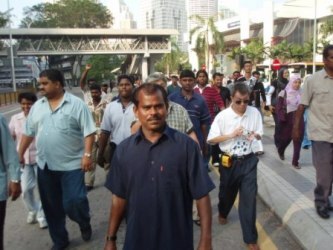 Hindraf supporters were still seen coming from all roads leading to the final destination. But there was no way to move further on. FRU trucks were lined alongside the road divider. Further ahead, FRU personnel were fully armoured and ready. There was also a roadblock at the Jalan Yap Kwan Seng junction. The access was deadlocked. zorro and i still would not give up. We crossed the road where the last FRU vehicle was parked and hoped to sneak through from there. As we reached the road divider an un-armoured, un-helmeted, sweaty and bushed-looking FRU officer walked towards us. He didn’t seem threatening nor was he in a rush to reach us. We greeted him and struck up some small talk with him. He told us that he had not slept since his operation at Batu Caves last night. He added that his job here today was not to “pukul orang” but to disperse the crowd. He advised us to leave the area soon before tear gas was fired. We complied. But not before i managed to take a snapshot of zorro with the officer. zorro returned the favour by taking a shot of me with the officer. As we walked away and crossed the road, both zorro and i shared the same observation. “What a nice fellow he was.” Well, i suppose he too had a job to do … can’t blame him. On the other side of the road i decided that i’ll take some more shots and that’s when we met up with this group from Kedah. i made sure that zorro was in the shot with the group. We were told later that some of them were from Sungai Petani and some were from Kulim. Wow, i thought, all the way from the north. What dedication. What support. The Hindraf rally must have meant a lot to them to travel the distance. While zorro and i were hanging around Jalan Tun Razak, we talked to some more brothers while we were still scheming of our next move. We met Mark and his wife Lucy from Puchong. Both were probably in their late 40s. 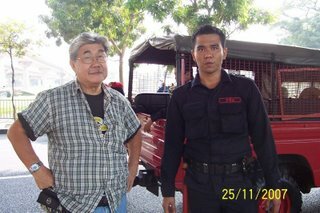 Mark recounted to us how he was kicked by the polis in the hand and back much earlier in Jalan Ampang. We empathized with them and offered our sympathy. Zorro, being the more fatherly and caring one, went one further. He told Lucy to make sure to nurse Mark’s bruises when they reach home. There were some unexpected reactions we encountered when we tried to talk to some of our brothers / sisters or take pictures. We enquired about their suspicion and what we were told we did not know whether to take it as a compliment or to laugh. They thought we were Special Branch. Oh, blimey! After a little more of hanging around and searching for inspiration, we finally decided to call it a day. The time was probably close to 11.30 a.m. If anything were to be accomplished, it would have been all over. There was no taxi we could flag down. We walked all the way to Chow Kit area and hopped into a cab to go to Masjid Jamek for our LRT ride to Taman Jaya. zorro bought the beers at PJ Club. >>> In concluding, and speaking for myself, my observation was that our brothers and sisters were very well behaved. There were no untoward incidents. No threatening moves. No ill-intent for destruction. The people are matured and ready for peaceful demonstrations. i wish the administration and the polis had matured in parallel to allow such. You are a true Malaysian indeed. I too do not share the trillion dollar class-action claim but I do empathise with our fellow Malaysians calling for this cause. As I watched the TV footages of yesterday’s events, I can’t help but think that the authorities over reacted. With the road blocks and roads closures… As if they are expecting an emergency situation of a mammoth kind. I was shocked to see rounds of tear gas fired into a group of people. If the objective is to disperse the crowd, why the continuous firing of tear gas, without even stopping to check if the crowd is moving back (which I saw the people did). I was sad to see such scenes in our once peaceful Malaysian roads. Why not give them a permit to rally. Set conditions for a peaceful rally and if the organisers failed to comply, appropriate actions to be taken. What I do not understand is why the PM’s S-I-L was given a permit to protest during Condoliza Rice’s visit. I saw the footages too and blimey, he was rowdy, behaved like a ruffian. Why this double standard I mused. Is it because he’s more learned and therefore will behave like a gentlemen? Sigh! I am becoming more and more disillusioned with the people up there who are entrusted to run this country. But I am glad there are still people like you and Zorro who are not afraid to speak out what is right. For now, I can only pray and pray hard for justice in this country. Have a good day. – Thank you, Peng for your compliment. I wished more Malaysians of other colours had joined in the walk to show solidarity. Peng, it is guys like you who give ewoon and I the extra energy and push to walk our talk. ewoon, I said it over nasi lemak and I say it again: I WAS PROUD TO HAVE WALKED ALONGSIDE YOU. … and to share the rounds of beers at the PJ Club as a reward for a meaningful Sunday well-spent with an anak Bangsa Malaysia. – zorro, i feel the exact same way, too. We need no urging. We did what we felt was the right thing to do. And thanks for the beer, bro. ewoon, how come we took the LRT to KL instead of Kelana Jaya. Definitely not the beer….could it be the euphoria of the day…..the gathering of our Indian brothers and sisters sent two messages: we are not afraid of breaking YOUR one-sided laws…(recall KJ on Condy Rice) and the crowd will never vote MIC. An Indian sitting across in the copi-tiam this morning said he recognised me (6 degrees?) and expressed that sentiment about the next election. – i think it’s exactly as you have said it. i concur, MIC is history. My heart swelt with pride at you and Unker Zorro’s decision to stand with our Indian brothers and sisters. I too can’t make head or tail of the trillion-dollar lawsuit but if I wasn’t here in the swamps I would have gladly walked with you guys. Simply to show empathy and solidarity as a normal human being would… I may not understand it much but in the pit of my stomach I feel there is some legitimacy to their claims. Of course as said in Unker’s blog, the tani session at the end would have been reason enough. Ha-ha. Thanks for the great write-ups and photos ‘bro! – i have no doubt you would have walked with us should you have been away from the swamp. We didn’t do anything special but as you have aptly said, “Simply to show empathy and solidarity as a normal human being would.” See you soon, bro. The discriminated can’t stay quiet and observed the continuous onslaught. The system is affirmative in discriminating but the denial is obvious. The looting is getting insidious and beyond portion. The people are suffering as the nation is sliding down drastically. Soon, we could even see uprising if the system administrators did not stop the hemorrhaging process. It’s becoming unbearable. – It takes two to tango. We would like to engage the administration but the powers-that-be are hell bent on the status quo. In a situation where the dance has to go on, the answer would be to change partner. BN will be history. When it comes to $$$ people will drive in masses, more so when the dangling carrot is in the tune of trillions. Come on, is this a quick rich scam or what? I feel pity to those people, race aside. – It did occur to me that the hope of money was probably why the turnout was so large. But when one examines what these Malaysians have been subjected to and that MIC was paralyzed to help the lure of money becomes secondary. They want the administration to hear their grouses and the Hindraf rally offered an opportuned platform.